A new study from the University of North Carolina at Chapel Hill reports that protecting coral reefs from fishing and pollution does not help coral populations cope with climate change. The study also concludes that ocean warming is the primary cause of the global decline of reef-building corals and that the only effective solution is to immediately and drastically reduce greenhouse gas emissions. 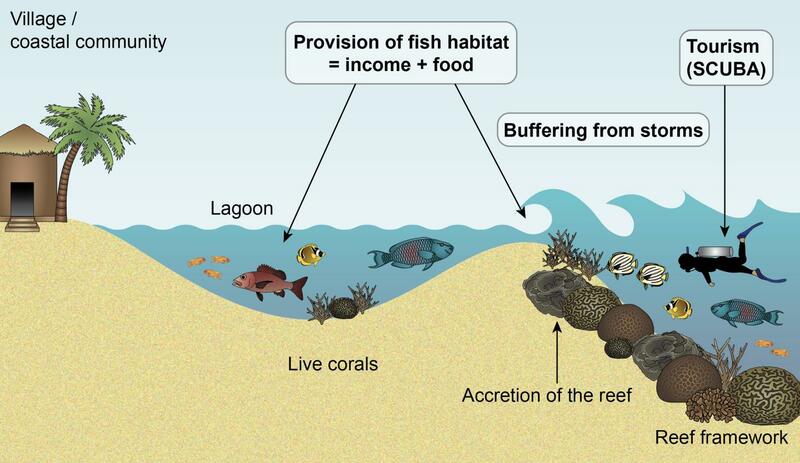 The new study published in the Annual Review of Marine Science (accessible via MarXiv: https://marxiv.org/ugk4v) found that coral reefs in areas with fishing and pollution regulations had the same level of decline as the coral reefs in unprotected areas, adding to the growing body of evidence that managed resilience efforts, like fishing and pollution regulations, don’t work for coral reefs. This finding has important implications for how to protect reefs and best allocate scarce resources towards marine conservation. Ocean warming is devastating reef-building corals around the world. About 75 percent of the living coral on the reefs of the Caribbean and south Florida has been killed off by warming seawater over the last 30 to 40 years. Australia’s Great Barrier Reef was hit by extreme temperatures and mass bleaching in 2016 and 2017, wiping out roughly half of the remaining coral on the Great Barrier Reef’s remote northern section. Corals build up reefs over thousands of years via the slow accumulation of their skeletons and coral reef habitats are occupied by millions of other species, including grouper, sharks, and sea turtles. In addition to supporting tourism and fisheries, reefs protect coastal communities from storms by buffering the shoreline from waves. When corals die, these valuable services are lost. The most common response to coral decline by policy makers and reef managers is to ban fishing based on the belief that fishing indirectly exacerbates ocean warming by enabling seaweeds that overgrow corals. The approach, referred to as managed resilience, assumes that threats to species and ecosystems are cumulative and that by minimizing as many threats as possible, we can make ecosystems resilient to climate change, disease outbreaks, and other threats that cannot be addressed locally. The study’s authors, led by John Bruno who is a marine ecologist in the College of Arts and Sciences at the University of North Carolina at Chapel Hill, performed a quantitative review of 18 case studies that field-tested the effectiveness of the managed resilience approach. None found that it was effective. Protecting reefs inside Marine Protected Areas from fishing and pollution did not reduce how much coral was killed by extreme temperatures or how quickly coral populations recovered from coral disease, bleaching, and large storms. “Managed resilience is the approach to saving reefs favored by many scientists, nongovernmental organizations, and government agencies, so it’s surprising that it doesn’t work. Yet the science is clear: fishery restrictions, while beneficial to overharvested species, do not help reef-building corals cope with human-caused ocean warming,” said Bruno. The 18 individual studies measured the effectiveness of managed resilience by comparing the effects of large-scale disturbances, like mass bleaching events, major storms, and disease outbreaks, on coral cover inside Marine Protected Areas versus in unprotected reefs. Many also measured the rate of coral population recovery after storms. The decline in coral cover was measured directly, via scuba surveys of the reef, before and periodically after large-scale disturbances. Overall, the meta-analysis included data from 66 protected reefs and 89 unprotected reefs from 15 countries around the world. The study also assessed evidence for various assumed causes of coral decline. For many, including overfishing, seaweeds, and pollution, evidence was minimal or uncertain. In contrast, the authors found that an overwhelming body of evidence indicates that ocean warming is the primary cause of the mass coral die-off that scientists have witnessed around the world. Bruno collaborated with Dr. Isabelle Côté of Simon Fraser University and Dr. Lauren Toth of USGS St. Petersburg Coastal and Marine Science Center. Research was funded by the U.S. National Science Foundation, the Natural Sciences and Engineering Research Council of Canada, the U.S. Geological Survey’s Coastal and Marine Geology program and the Climate and Land Use Research and Development program.